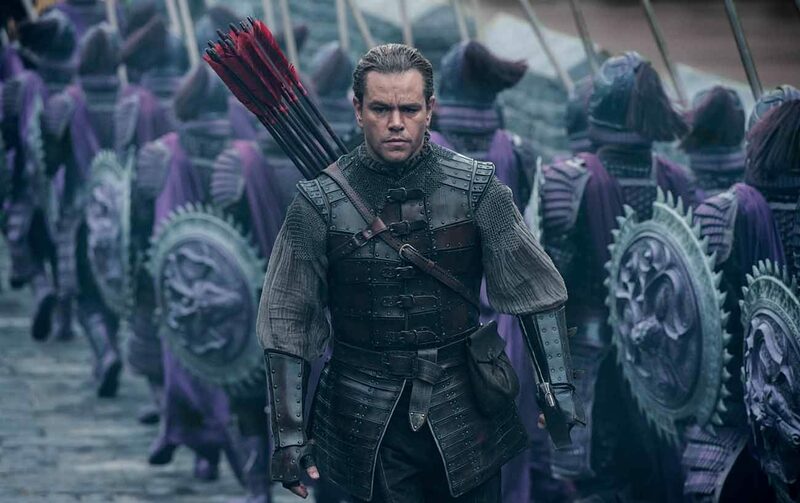 NEW YORK (CNS) — Those seeking nothing more from a movie than sheer spectacle may be satisfied with director Zhang Yimou’s visually interesting but thoroughly implausible action adventure “The Great Wall” (Universal). Epic in scale, the film is shallow in emotion and characterization. On the upside though, its central romance is completely chaste and its dialogue mostly free of cursing. To appreciate those assets, however, viewers will first have to swallow a whopper of a premise. Drawn by the wealth they could gain by introducing gunpowder into the West, two medieval European mercenaries, William Garin (Matt Damon) and Pero Tovar (Pedro Pascal), arrive in China after an arduous journey during which they were harried, as the opening scenes show, by unidentified adversaries. But an unpleasant surprise awaits the visitors. As they soon discover, their unwilling hosts are preoccupied with battling vicious alien monsters called the Tao Tei. It was to defend against these marauding creatures, whose idea of eating Chinese has nothing to do with General Tso’s chicken, that the famous structure of the title was built. Or so, at least, the script — written by Carlo Bernard, Doug Miro and Tony Gilroy — attempts to inform us with a straight face. William gradually becomes committed to this struggle, not least because he’s attracted to Lin Mae (Jing Tian), the fetching commander of one division of the local forces, the Crane Corps (think Cirque du Soleil with spears). But Pero remains focused on the original scheme. He’s abetted in it by Ballard (Willem Dafoe), another traveler who came to the Middle Kingdom years before for exactly the same purpose as the new arrivals, and has been held prisoner ever since. What with catapults launching great balls of fire and innumerable colorfully uniformed soldiers manning the ramparts, there’s plenty to absorb the eye. As for the brain or heart, not so much. Super-skilled archer William undergoes something of a conversion, evolving from a lone wolf who boasts of trusting no one to a team player, at least where Lin Mae is concerned. And the movie’s conclusion does show him putting loyalty to Pero above potential profit, a choice the screenplay implicitly but unmistakably endorses. But he remains merely the battle-hardened, scarred warrior type rather than a fully rounded person. Nor is there much individuality to Lin Mae. Given that these two never so much as kiss, on the other hand, and that the screenplay is seldom marred by vulgarity, many parents may consider “The Great Wall” acceptable for older teens. All the more so since the mayhem of the fight against the Tao Tei is portrayed far more suggestively than graphically. The film contains action violence with little gore, a mild oath as well as at least one crude and a couple of crass terms. The Catholic News Service classification is A-III — adults. The Motion Picture Association of America rating is PG-13 — parents strongly cautioned. Some material may be inappropriate for children under 13.